To see Cleveland's TFi Putter Video, Tap/Click the "Play" button or view full-sized video in a new tab . Video courtesy Cleveland Golf. The Halo Smart Square putter. While it doesn’t have alignment lines that sit 21.35 mm above the surface, it does have dual axis alignment lines in the form of two squares that sit parallel and perpendicular to the line. Cleveland created the Halo Counterbalanced putter to give golfers better feel, touch, consistency speed, and path. Counterbalanced putters place a heavy mass on both the grip and head of the putter. The extra weighting boosts MOI, producing a more stable putting stroke. In short, Halo Counterbalanced putters mimic anchored putters for stability and feel. Cleveland's TFi ISO features a more traditional mallet design but with connected wings in a rounded back. The TFi face provides great feel with a milled, copper-infused face cap and yields better forgiveness and responsiveness because of its copolymer insert. As with other high-density winged putters, the wings increase shot stability and moment of inertia (MOI) when paired with a low-density aluminum body. The Cleveland TFi RHO incorporates two extended wings that connect at the squared-off back. The TFi face technology offers golfers the best of both worlds from the feel of a milled putter to the consistency and forgiveness of an insert. Cleveland's TFi Smart Square mallet putter consists of 17 separate components that work together to provide excellent stability and solid performance in a light-weight aluminum body. 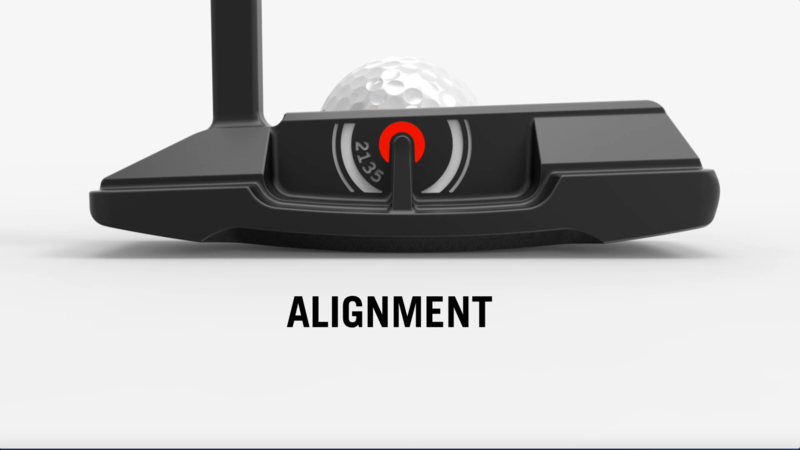 The TFi Smart Square putter has a large, dual-square alignment assist much like a 2-ball putter. The face is a full-face design made of copper-infused aluminum backed by a polymer insert for great feel and forgiveness. The wing on the back is made of high-density material that boosts MOI for even more forgiveness. North Iowa Golf either stocks or will order Cleveland Men's Putters in all popular models. Stop by North Iowa Golf and try one out today!